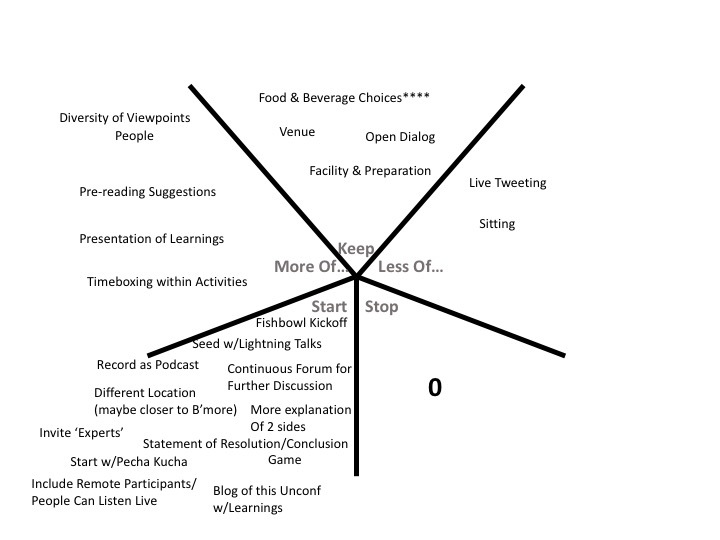 Below are the results of the post conference retrospective. Some of these are self-evident, but a few were discussed in some amount. We discussed how recording as a podcast may impede conversations and open dialog. People may not be as willing to state items if they were taking a view contrary to say an employer they have. We also discussed the idea of inviting additional experts; while people were reached out, we want open dialog and if 1-2 people come in that are felt to be anointed in the area, that may again stifle open conversation. Lastly we also discussed about having a statement of resolution; Agile Dialogs isn’t about trying to find one ending conclusion, but simply to allow each side to discover more about the other side. Having a conclusion would make it more like a debate as opposed to dialog.